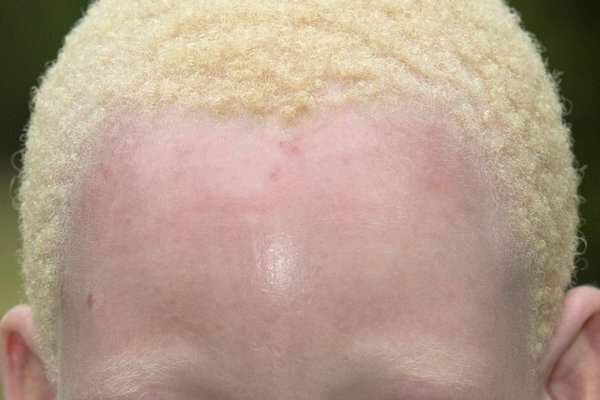 Albinism affects the production of melanin, the pigment that colours skin, hair and eyes. It's a lifelong condition, but it doesn't get worse over time. People with albinism have a reduced amount of melanin, or no melanin at all. This can affect their colouring and their eyesight. Albinism is caused by faulty genes that a child inherits from their parents. People with albinism often have white or very light blonde hair, although some have brown or ginger hair. The exact colour depends on how much melanin their body produces. Very pale skin that burns easily in the sun and doesn't usually tan is also typical of albinism. Someone with albinism can have pale blue, grey or brown eyes. Eye colour depends on the type of albinism and the amount of melanin. People from ethnic groups with darker pigmentation tend to have darker coloured eyes. The reduced amount of melanin can also cause other eye problems. This is because melanin is involved in the development of the retina, the thin layer of cells at the back of the eye. Some young children with albinism may appear clumsy because problems with their eyesight can make it difficult for them to perform certain movements, such as picking up an object. This should improve as they get older. In most cases, including all types of OCA and some types of OA, albinism is passed on in an autosomal recessive inheritance pattern. This means a child has to inherit two copies of the faulty gene (one from each parent) to have the condition. If both parents carry the gene, there's a 1 in 4 chance that their child will have albinism and a 1 in 2 chance that their child will be a carrier. Carriers don't have albinism but can pass on the faulty gene. Some types of OA are passed on in an X-linked inheritance pattern. This pattern affects boys and girls differently: girls who inherit the faulty gene become carriers and boys who inherit the faulty gene will get albinism. When a mother is a carrier of an X-linked type of albinism, each of her daughters has a 1 in 2 chance of becoming a carrier and each of her sons has a 1 in 2 chance of having albinism. When a father has an X-linked type of albinism, his daughters will become carriers, and his sons won't have albinism and won’t be carriers. Read more about how mutations are passed on. If you have a history of albinism in your family or you have a child with the condition, you may want to talk to your GP about getting a referral for genetic counselling. A genetic counsellor provides information, support and advice about genetic conditions. For example, you can discuss with them how you inherited albinism and the chances of passing it on. Albinism is usually obvious from a baby's appearance when they're born. Your baby's hair, skin and eyes may be examined to look for signs of missing pigment. As albinism can cause a number of eye problems, your baby may be referred to an eye specialist (ophthalmologist) for tests to check for conditions such as nystagmus, squint and astigmatism. Electrodiagnostic testing is also sometimes used to help diagnose albinism. This is where small electrodes are stuck to the scalp to test the connections of the eyes to the part of the brain that controls vision. Although there's no cure for the eye problems caused by albinism, there are a number of treatments, such as glasses and contact lenses, that can improve vision. A child with albinism may also need extra help and support at school. As a child with albinism gets older, they'll need regular eye tests, and it's likely they'll need to wear glasses or contact lenses to correct problems such as short-sightedness, long-sightedness or astigmatism. The Royal National Institute of Blind People (RNIB) has more information about living with low vision, including a section on education and learning. Sunglasses, tinted glasses and wearing a wide-brimmed hat outside can help with sensitivity to light. There's currently no cure for nystagmus (where the eyes move from side to side involuntarily). However, it isn't painful and doesn't get worse. Certain toys or games may help a child make the most of the vision they have. An ophthalmologist will be able to provide further advice. Surgery, involving dividing and then reattaching some of the eye muscles, may occasionally be an option. Read more about the procedure "tenotomy of horizontal eye muscles for nystagmus". The main treatments for squints are glasses, eye exercises, surgery and injections into the eye muscles. If your child has developed a lazy eye, they may benefit from wearing a patch over their "good" eye to encourage their other eye to work harder. Read more about treatments for squints. Because people with albinism lack melanin in their skin, they're at increased risk of getting sunburn and skin cancer. If you have albinism, you should wear sunscreen with a high sun-protection factor (SPF). An SPF of 30 or more will provide the best protection. Report these to your doctor as soon as possible. Skin cancer is much easier to treat if it's found early. Read more about protecting your skin and eyes from the sun. There's usually no reason why someone with albinism can't do well in normal schooling, further education and employment. With appropriate help and support, most children with albinism can attend a mainstream school. Speak to your child's teacher if your child experiences bullying or name-calling because of their condition. Read more about bullying, including advice for parents. It may also help to talk to other people with albinism. The Albinism Fellowship has a contact person network that can provide advice and support locally. If you or your child has albinism, your clinical team will pass information on to the National Congenital Anomaly and Rare Diseases Registration Service (NCARDRS).